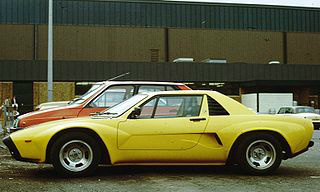 The mid-engined sports car was all the fashion in 1972, and AC responded by creating a concept, referred to as the Diablo, which used an engine from the Austin Maxi saloon. Subsequently, at the 1973 London Motor Show, the company premiered the new prototype, a mid-engined fixed head coupe, powered by a 3 litre, Ford Essex V6 overhead valve engine, as used in the Ford Capri saloon. It was positioned transversely, and fitted to an in-house AC five speed gearbox. Virtually all the components were available from either Ford or Triumph. Fitted with a single Webber 38/38 EGAS carburettor, it developed 138 bhp at 5000 rpm, and 192 ft/lbs of torque at 3500 rpm. This produced a top speed of 120 mph, with a 0-60 mph time of 8.5 secs. 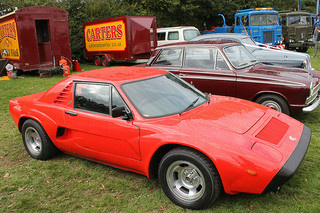 By 1974, work on the body styling was almost complete, with the original shape of the Diablo being retained. In the final stage, the front section was trimmed, the height of the roof was increased, and air intakes were added to improve cooling. At this point, the process of type approval began. In 1975, the car initially failed the crash test as part of the type approval. However, after redesigning some of the chassis components, and having made changes to the steering column, approval was granted. The dealer network was now established for the new car, which was now referred to as the AC 3000ME sports car, where the symbol ME referred to mid-engine. The car was finally launched at the October 1978 NEC Motor Show in Birmingham where, it was claimed, 50 orders had been taken. It used a steel chassis which incorporated a matrix of square tubing onto which was positioned a glass fibre body. It had coil spring independent suspension all round, with four wheel disc brakes, and Wolfrace slotted alloy wheels. The interior was decked in cloth as standard, although leather seats were available as an optional extra. Unfortunately, by this time, the body styling was beginning to look somewhat dated. Two of the problems that afflicted the 3000ME involved the inflated launch price, coupled with the fact that it took nearly 7 years for the original prototype to finally reach production. In March 1980, the price of the car was set at £13,300 in standard trim, and £13,600 when fitted with leather seats and a cassette radio. On the other hand, the price quoted by its competitors was £14,980 for the Lotus Esprit Series 2, with £12,780 for a TVR Tasmin, and £14,000 for a 924 Porsche Turbo. In 1981, as a cost cutting measure, the dealer network was discontinued, with the company selling the car directly from the factory. In 1984, with the country in recession, production was halted with only 71 card having been built. Shortly afterwards, the company was bought out and renamed AC Scotland, with production facilities being transferred to near Glasgow. The car was now priced at £13,881. Since the Chrysler Linwood plant had closed, the area was run down, and there were many skilled workers available for the planned production of 400 units per year. The company took the view that since the unstressed 3000ME body was fitted to a strong chassis, this meant that other bodies could be designed for future development. 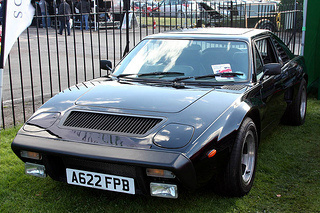 However, in 1985, after a further 30 units of the AC 3000ME sports car had been built, AC Scotland was wound up in October of that year, and production ended. It is worth noting that 19 units received an aftermarket conversion in which the output was increased from 138 bhp to around 200 bhp.